“We have come a long way since we started our work together and there is huge potential to expand our collaboration. 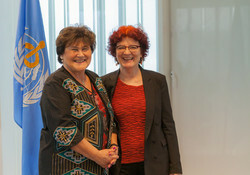 We need to do this for the benefit of the health of the people in Europe.” This was the unanimous sentiment from Dr Zsuzsanna Jakab, WHO Regional Director for Europe, and Dr Andrea Ammon, Director of the European Centre for Disease Prevention and Control (ECDC), on the day of Dr Ammon’s first official visit to the WHO Regional Office in Copenhagen. During a meeting on 15 January 2018, the 2 organizations strengthened their commitment to collaborating on infectious diseases and disease outbreaks by establishing operational guidelines on collaborative actions. A set of new General Principles of Collaboration were endorsed on the occasion. The renewed collaboration of WHO/Europe and ECDC will improve support to European countries to reach the Sustainable Development Goals through addressing communicable diseases and antimicrobial resistance and strengthening immunization. It will also contribute to ensuring that 1 billion people are better protected from health emergencies, as set out in WHO’s vision for 2019–2023. WHO/Europe and ECDC collaborate within a memorandum of understanding (2005) and an administrative agreement (2011) on public health development in Europe. This collaboration focuses on communicable diseases surveillance, prevention and control, risk assessment and communication, health emergencies and utilizing the International Health Regulations to prevent and respond to health threats. A joint Coordination Group of WHO/Europe and ECDC has been established to facilitate collaborative efforts. Annual joint activity plans are agreed upon and their implementation is discussed on a regular basis. Staff members from both agencies interact regularly to ensure information sharing and synergy in the implementation of activities.